UAE is the largest and potential markets for fitness equipment in the GCC region. Unlike, other Middle East countries UAE has more open culture. With growing population and presence of huge number of expat population has encouraged national as well as international fitness companies to invest in this market. Additionally, rising wellness tourism industry resulted UAE to emerge as a major leisure and entertainment hub. 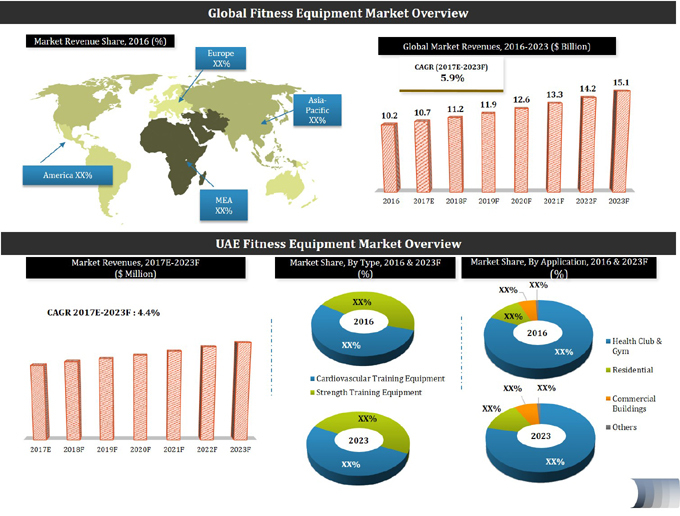 According to 6Wresearch, UAE fitness equipment market is projected to grow at a CAGR of 4.4% during 2017-23. Rising disposable income and increasing health concerns is resulting in addition of number of health clubs and gyms in the country. Further, government initiatives and availability of fitness centers in residential and commercial buildings with discounted memberships would encourage the fitness equipment market in the coming years. Moreover, overweight and obesity has become a major concern in UAE, resulting in severe heath issues such as diabetes, hypertension and cardiovascular diseases which enforces people to look after their health. In addition, trend to have ripped and lean body among youngsters would buoyed the market of fitness equipment in the country. Cardio training fitness equipment segment has dominated the overall fitness equipment market. Dubai region has the majority of health clubs and gyms accounting for extensive revenues in UAE's fitness equipment market; and is expected to increase during the forecast period as well, owing to upcoming fitness centers across the region. The report thoroughly covers the fitness equipment market by types, applications, and regions. The report provides an unbiased and detailed analysis of the on-going trends, opportunities/high growth areas, market drivers, which would help the stakeholders to decide and align their market strategies according to the current and future market dynamics.